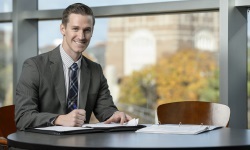 The Krannert Weekend MBA program provides a learning experience far superior to online-only options. Here, you interact in person with esteemed professors who bring extensive teaching, research, and industry experience to their instruction. Through case studies, research projects, group presentations, and lectures, Purdue’s Weekend MBA courses enhance your critical abilities and skills in decision and policy-making aspects of finance, marketing, leadership, and more. Plus, you’ll collaborate with like-minded professionals from diverse industries to learn from their methods. The courses in the program have an applied policy-making orientation, including extensive use of cases and other experiential materials. The curriculum comprises a set of common core courses that all participants take. This design is consistent with the standards of AACSB International – The Association to Advance Collegiate Schools of Business–and is accredited by that global association of management master’s degree programs. The Weekend MBA is a cohort program, in which all participants enter, take the common set of courses, and graduate together. This fosters engaging and vibrant in-class sessions every other Saturday. At the initial orientation sessions, participants are introduced to the program, as well as the greater Krannert and Purdue community. Participants download weekly reading and written assignments, all of which are specified in course syllabi accessible from our on-line course management database, Blackboard, in the week prior to each in-class Saturday session. Each course includes a combination of lectures, discussions, case analyses, computer simulations, study group presentations, and research projects. Written examinations, class participation, and other assignments contribute to determining grades for each course. The program is intensive, demanding, and rigorous – but richly rewarding. We expect serious preparation and total commitment from all participants. Program alumni report that, because the work is intellectually challenging, the improvement in their managerial skill set was both immediate and substantial.